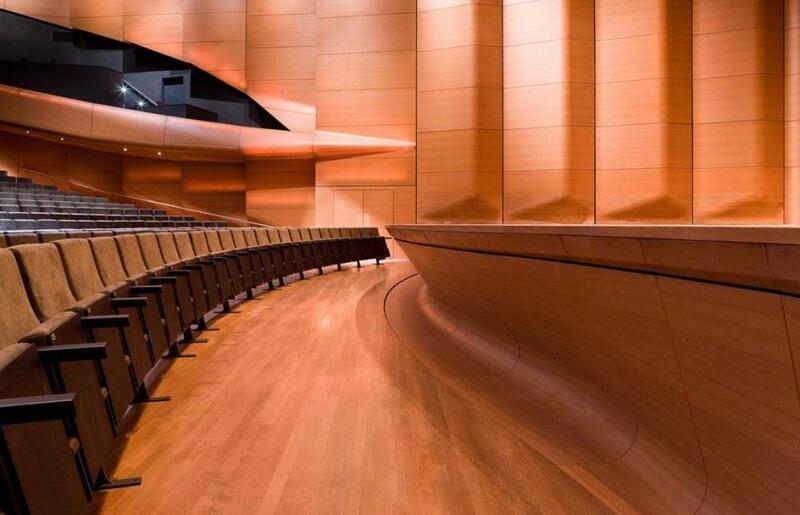 The redesign of Alice Tully Hall transforms the 1,100 seat venue from a good multi-purpose hall into a premiere chamber music venue with street identity and upgraded functionality for all performance needs. 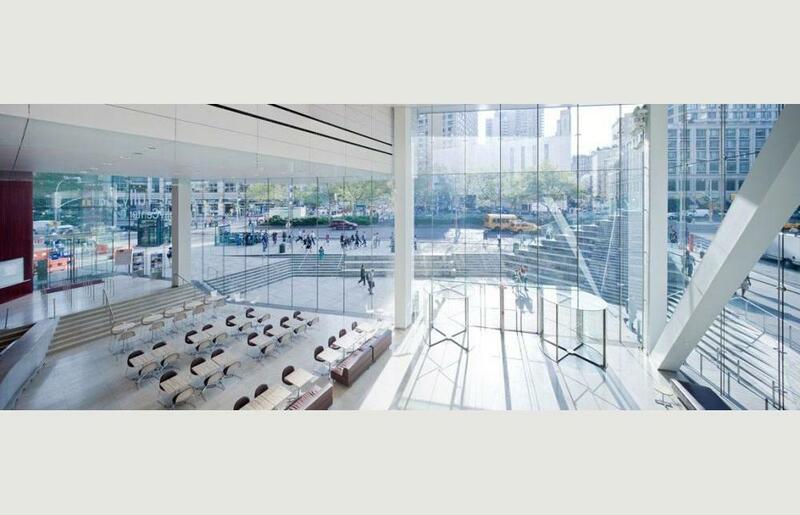 A shear one-way cable net glass façade puts the hall on display. A commonly held opinion about the hall interior is that it lacks intimacy. 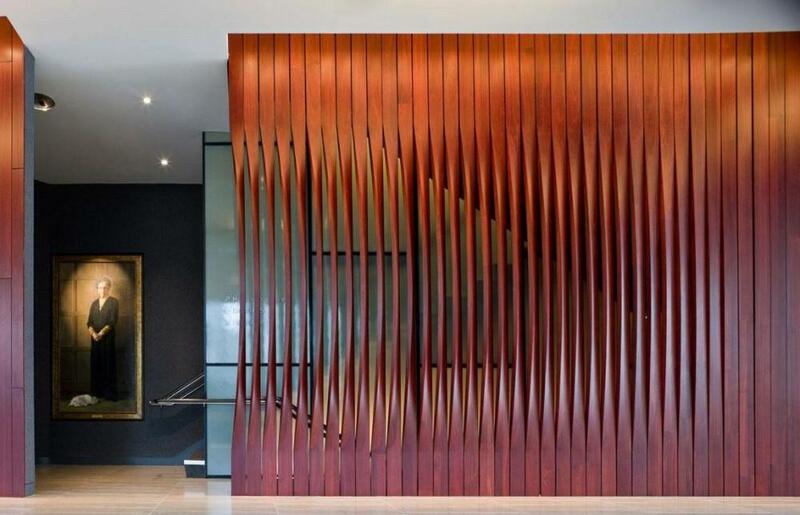 For the redesign, “intimacy” is interpreted as both an acoustic and visual pursuit. A partial box-in-box construction isolates the hall from the vibration from the 7th Avenue subway and a new high performance inner liner is acoustically engineered to distribute sound evenly throughout the house. 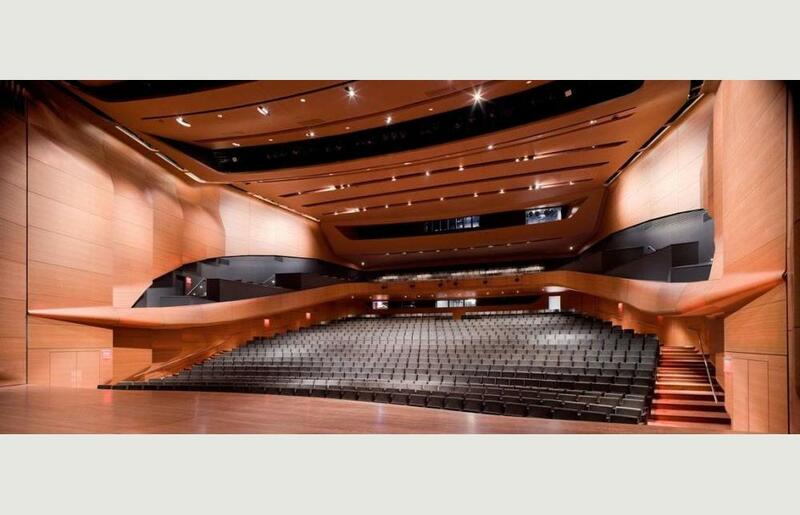 The liner of African moabi is tailored around all existing hall features and new programmatic elements, eliminating all visual noise that distracts the audience from the performance. Illumination emerges from the wood skin much the way a bioluminescent marine organism exudes an internal glow. 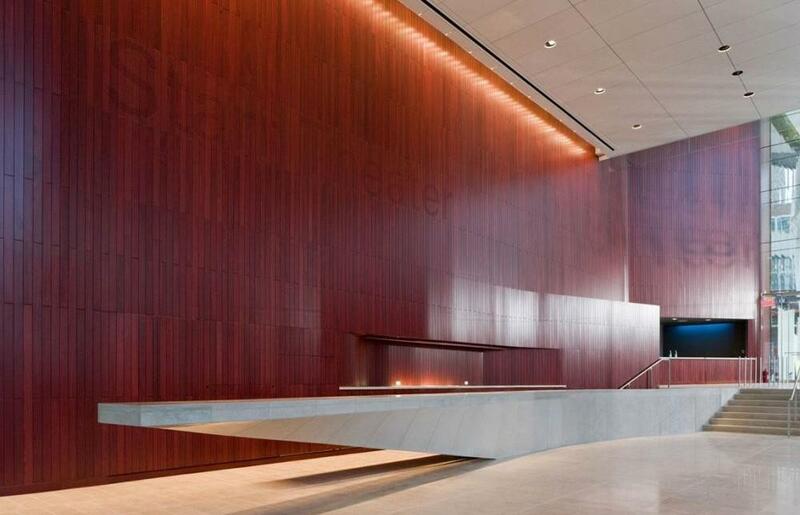 The wood liner is constructed of translucent custom-molded resin panels surfaced in veneer to match and blend seamlessly with the wood, binding the house and stage with light. Like the raising of a chandelier or the parting of a curtain signaling the start of performance, the blush will be part of the performance choreography. 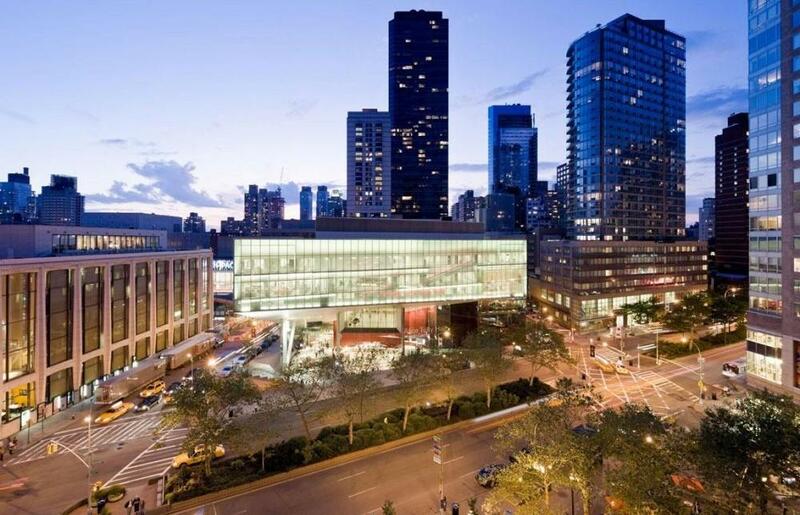 After 50 years in existence, the Lincoln Center campus was in need of an update both physically and philosophically. Rather than oppose the architectural strategies of the existing modern buildings, our design reinterprets the genetic code of the campus into a language that can speak to a diverse audience after several generations of social and political change. 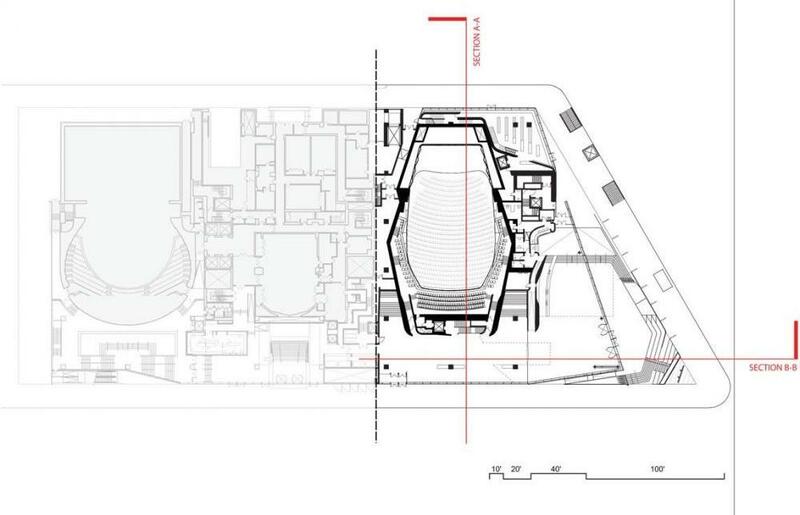 The redesign is intended to turn the campus inside out by extending the spectacle within the performance halls into the mute public spaces between the halls and into the surrounding streets. 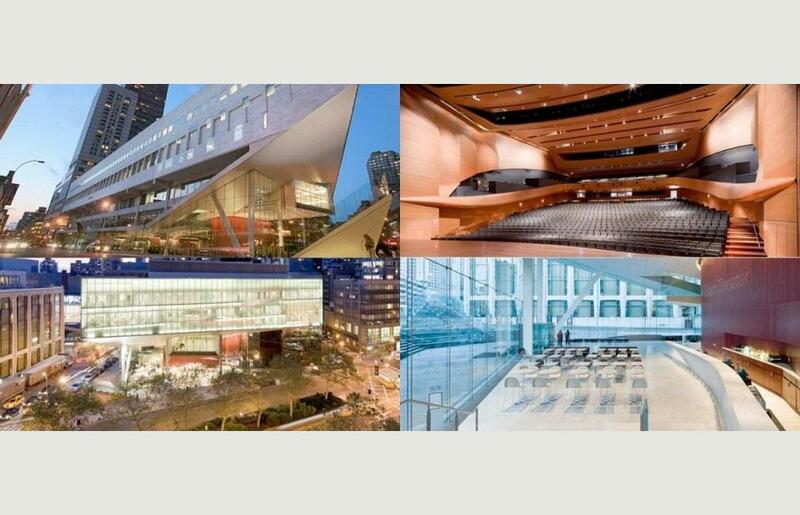 Through strategic architectural updates, the entire campus will have a radically new identity without sacrificing the qualities that have made Lincoln Center an international icon and symbol of New York. 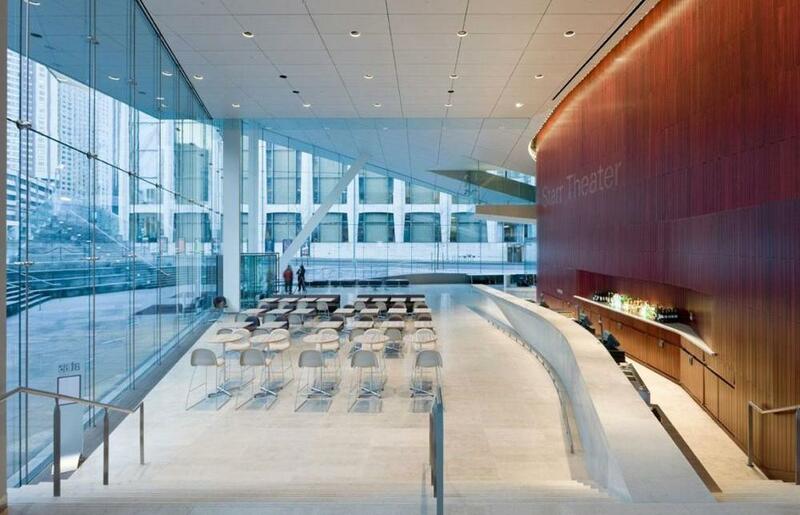 Alice Tully Hall and its public spaces occupy the ground floor of Pietro Belluschi’s Juilliard School building. 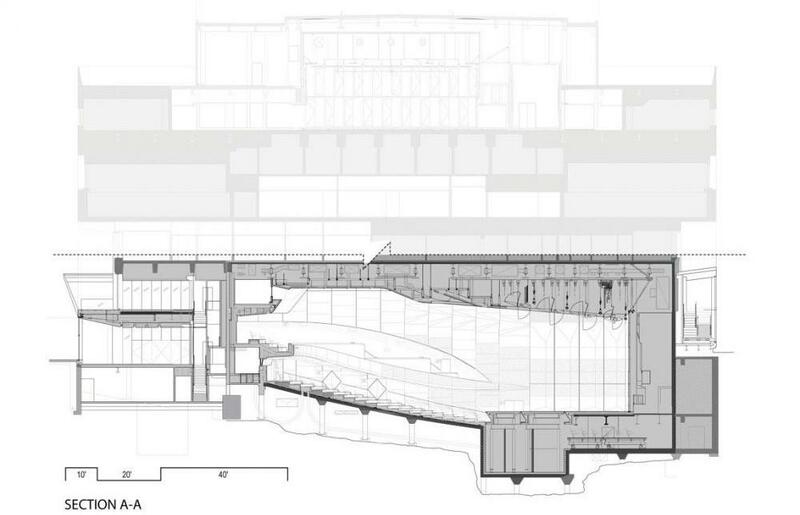 Tucked under the Juilliard School, the opaque base of Pietro Belluschi’s building is stripped away to reveal the hall’s outer shell. 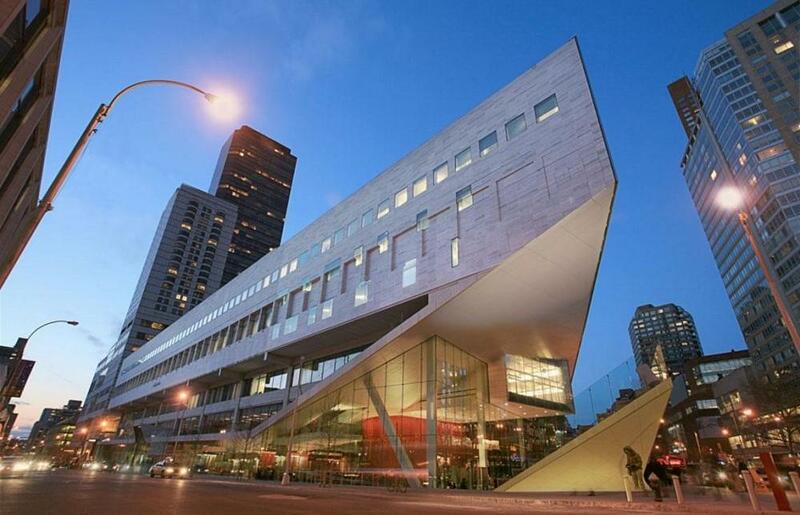 The sloped underside of Juilliard’s expansion serves as the canopy framing the hall, its expanded lobby and box office. 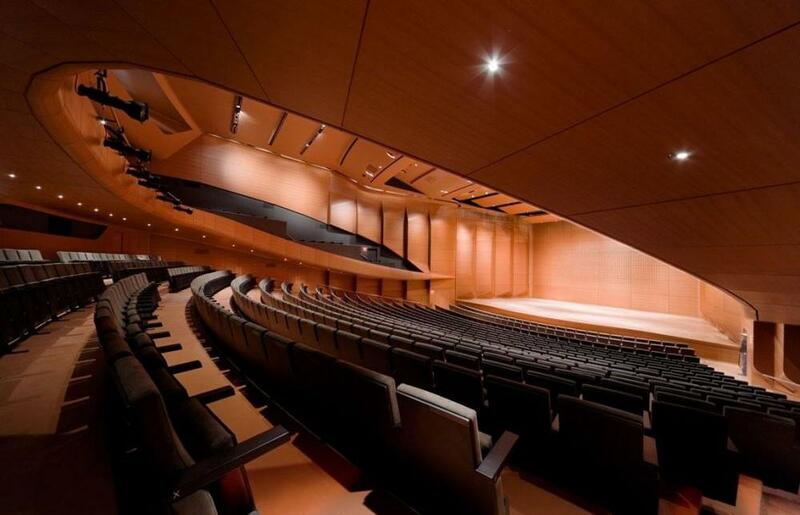 One of the primary reasons for the overall renovations at Lincoln Center stemmed from the need to update and reduce energy consumption across the campus. The Central Mechanical Plant, which serves all 11 venues and 10,000 people on campus, was completely rebuilt and upgraded to 21st century technology providing substantial increases in efficiency. The renovation has already been awarded The Platinum Award for Engineering Excellence in recognition of its environmentally sensitive design. 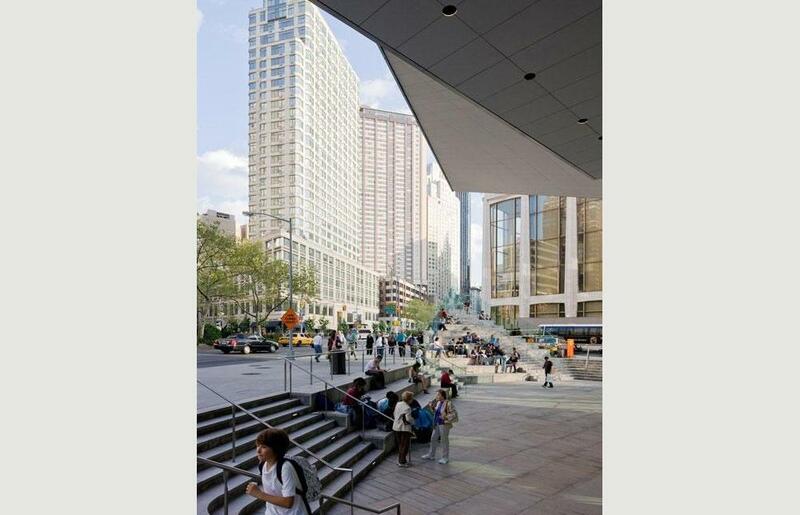 Other sustainable design strategies include the green roof lawn on the Hypar restaurant; high performance exterior wall systems across the campus; radiant heat and cooling systems at Alice Tully Hall; FSC certified wood products throughout, and integral sun shading on exposed glass surfaces.